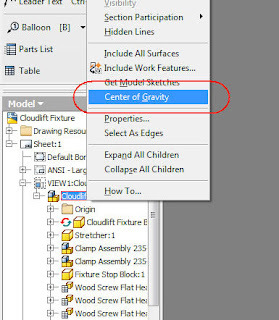 One of the nice 'subtle but significant' new features in Inventor R2009 is the ability to add a center of gravity marker to your drawing. 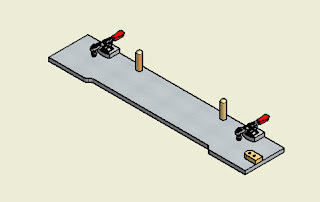 I'm starting out with a view of a simple jig, but we want to show the COG for this asssembly. Here's a picture, although we'll actually show the COG in the top view. 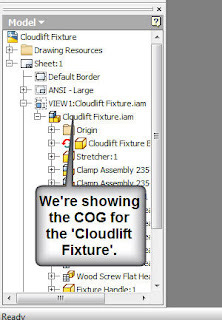 1) In the browser, locate the part or assembly where you want to show your COG. 2) Right click on the assembly of interest, and choose the 'Center of Gravity' option. 3) That's it! the COG will be shown on your view! 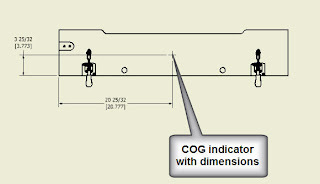 You can also place dimensions on it so you know exactly where it is!